Manchester United manager Jose Mourinho has stated that Chelsea have been successful this season because of their well trooped defensive mentality. In a recent interview with Sky Sports, Jose Mourinho admitted that the defensive mentality under Antonio Conte has been key for Chelsea in the title race this season. After 17 games, Chelsea are at the top of the Premier League table with 43 points, and it is very clear that new manager’s tactics have been successful at the London club. Meanwhile, Manchester United are still struggling to get into the top four this season. Jose Mourinho’s men are currently 6th in the league table, 13 points behind table toppers Chelsea. The Blues are currently on a record 11-match winning streak. 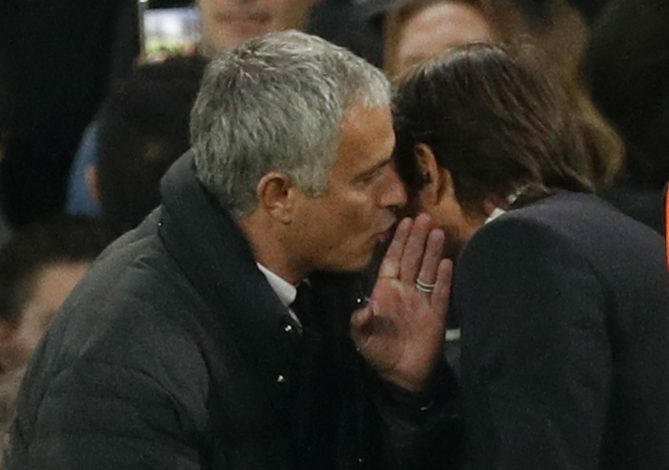 This also means that Antonio Conte has overtaken Jose Mourinho’s record to become the first Chelsea manager to do so. And with Chelsea still flying high, Mourinho has admitted that he believes it will be very difficult for his team to catch his former team this season. “It’s very difficult, we have to be honest, and say that it’s very difficult, not just the difference in point but the Chelsea philosophy of play,” Jose told Sky Sports. He added: “They score one goal and they win, they defend a lot, they defend well. When they are winning, in the last 20 minutes they bring defenders in, they don’t care what people say, or with what people think, they just want to win.